The Japan International Research Center for Agricultural Sciences (JIRCAS) has played a central role in putting Japan at the forefront as one of the world’s leading countries that contributes to the international advancement of scientific research and collaboration in the field of agriculture, forestry, and fisheries. Through various joint research programs in developing regions, JIRCAS has not only provided valuable assistance in fostering human resource development, but has also served to promote gender equality. With the goal of further promoting women’s contributions to scientific and technological advancement in agriculture, forestry, and fisheries, JIRCAS actively participates in a program entitled “Initiative for Realizing Diversity in the Research Environment”, that is supported by funds from Japan’s Ministry of Education, Culture, Sports, Science and Technology. Under the auspices of this program, we are currently seeking to promote active roles for female researchers, both domestically and internationally. As well, we aim to implement international collaborative research activities that will improve nutritional conditions and welfare for all in the developing areas. In November 2017, we convened an International Symposium to explore ways of improving the nutritional value of crops and evaluating the nutritional content of foods, as well as tackling gender issues in context of rural development. 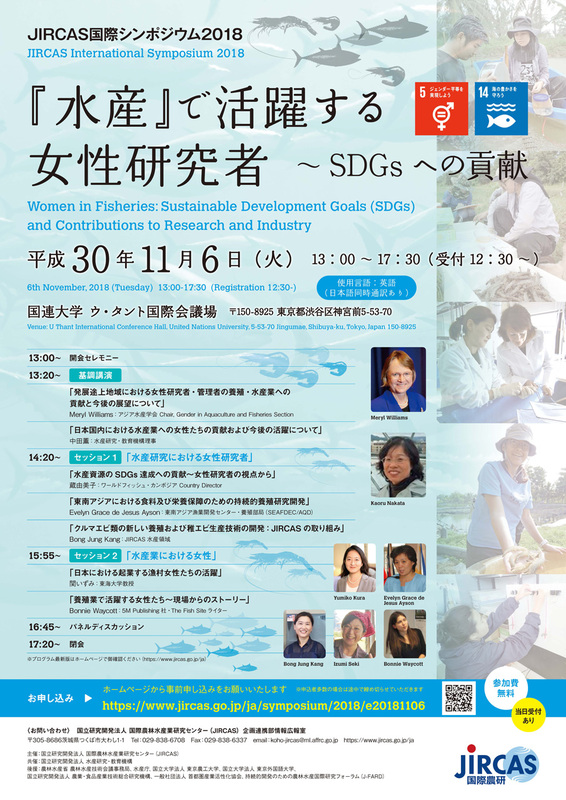 For this year’s International Symposium, leading female administrators and scientists in the field of fisheries will be invited to share with us their research findings and views on the need for the active participation, involvement, and leadership contribution of women working in fisheries research and technology development, with the over-arching aim of securing the Sustainable Development Goals (SDGs), thus leading to food security and a healthy future.